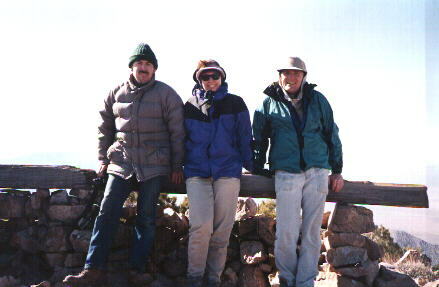 The first "official" ascent of Tikaboo was March 12, 1994 by Glenn Campbell, myself and my wife Jeri. At the time, it was obvious that Freedom Ridge would eventually be shut down, so I had been doing a number of sightline analyses of various mountain peaks, looking for alternatives. Pete Merlin had mentioned he attempted to get to the top of Tikaboo previously, but had been turned back by snow. By March conditions had improved to the point where it looked like it could be done. We were able to drive in as far as Badger Spring, and hoofed it through occasional snow patches from there. For our first trip up, we headed right, directly towards Tikaboo, rather than the present route up the talus to the false summit on the left. We soon found that was a mistake, did it anyway. Reaching the top, we found evidence that someone had been there watching previously. The elongated rock shelter that Glenn eventually turned into the "Shrine of Our Lady of the Black Budget" had been constructed to allow someone to peep at Groom in comfort. It was about the size of a bathtub, and pointed directly at Groom. This allowed someone to lay down inside it, out of the wind. There was a large flat rock at the back end against which their back would rest. And right across the top in front of where a person would recline was a 4x4 timber upon which they could rest a spotting scope, right in front of their face. There were also a few old MRE packets around. We never found out who constructed the shelter, and it was no one in our circle. My guess is that it was either serious espionage types, or maybe off duty millitary guys from Nellis determined to see for themselves if anything was going on out there. Nothing of particular note was visible at the base, with the exception (if I remember right) of the usual Janet activity. What was really great was the visibility that day. It was one of those very clear, spectacular days. At the time I thought it was one of the better mountain top views I had ever seen (and I still do). It didn't MATTER what was going on at the base. One curious thing. Glenn was in a construction mood on that trip, and we rearranged the big timbers up there, as well as piled rocks, to form sort of a wall, facing out towards Groom. This would allow to sit down and peep out with scope resting on the wall. It also kept us warm, because it was damn cold! When we returned a few weeks later (hauling up the sacramental lawn chairs), the thing had been knocked over. I still don't know whether it was wind, or someone pissed at what we had done. After the first ascent, we kept the spot quiet for quite some time as our secret "fall back" location, for the ultimate closure of Freedom Ridge. Later trips resulted in the clearing of brush, widening the access, and pushing the road to the saddle (which seems unreachable these days).